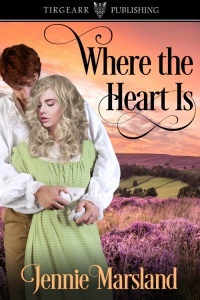 A rite of passage and a sweet love story, Where the Heart Is takes the reader to nineteenth century England. Young Rochelle “Chelle” McShannon, uprooted from America and transplanted in her father’s homeland, is in bereavement, not only for her dead mother, but also for the loss of a love that she’d believed was real and true and for her twin brother, Trey, who chose to stay in America. In the small community of Yorkshire Dale, she runs afoul of the mores of the villagers. Befriending a girl who is an unwed mother is bad enough, but spending two nights helping the precious baby girl Leah get accustomed to a new home with just the baby’s widowed father and a housekeeper in residence is an absolute non-no. Moreover, she danced with said widowed father, Martin Rianne at the community dance; AND he did not dance with anyone else. Martine Rianne, a successful farmer, still mourns the loss of his wife when baby Leah was born. He had farmed the baby out to live with a wet nurse and never went to see the child. His dead wife’s parents become the bane of his life—antagonists this reader REALLY didn’t like. Jennie Marsland wove together a short, but heart-touching love story that keeps one turning pages. She shows the reader the plight of the mill workers in the community, the moral corruptness of the ‘straight-laced” people who look down on Chelle, the story of her brother Trey, along with the happy, productive life of her father’s brother’s family. Chelle’s being involved in all these things transforms her.